The word plankton is Greek for wanderer/drifter. Plankton is microscopic organisms which all marine life depends on in order to survive; this is because they form the basis of the food chain in our oceans. 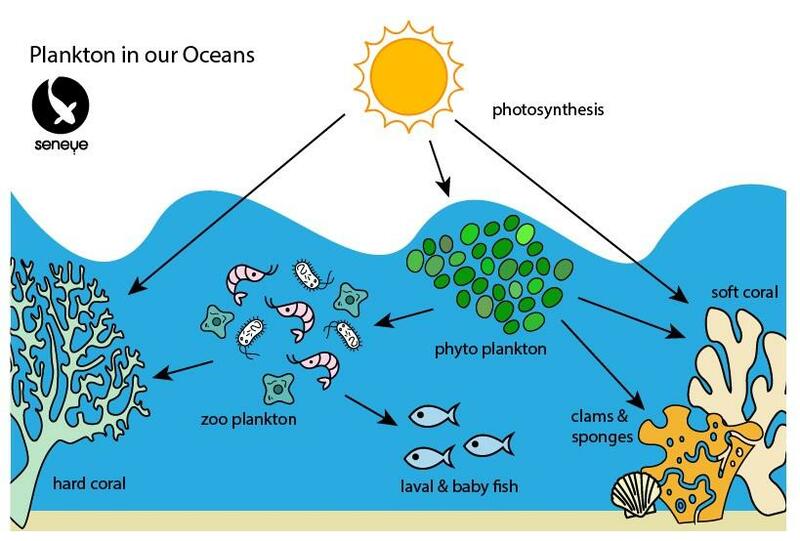 There are two main types of plankton, phytoplankton (light loving algae) which need light for photosynthesis. These types of plankton can be found drifting in the ocean’s upper water columns because this is where the light is strongest! If you wish to grow live phytoplankton at home or in a Lab you will need to ensure the algae is receiving the quantity and quality of light and nutrients to make it grow. A good light meter helps. Marine phytoplankton is considered a superfood because it contains vitamins, essential fatty acids (EPA, DHA, ARA), essential amino acids, protein, carbohydrates, minerals and bioactive ingredients involved in the metabolic activities of all living beings in general and in marine organisms in particular. One species of microalgae does not always provide all the nutritional requirements, but in nature, a supply of various species is always available allowing for a correct, nutritional balance. The second major group of Plankton is Zooplankton, which predominantly lives at the surface because this is where their food source, phytoplankton, bacterioplankton and sometimes other zooplankton, can be found. Please see our diagram below which explains the basic planktonic food chain. 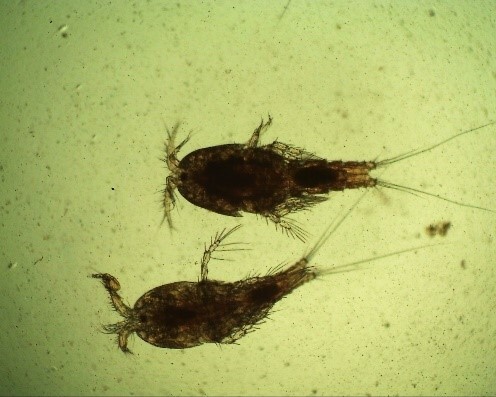 The main types of zooplankton are ciliates, copepods, rotifers, amphipods, and tintinnids. Below is an image of a copepod, a crustacean which makes up the natural diet for many fish such as mandarin dragonet (Synchiropus splendidus), Pipefishes (Syngnathinae) and Seahorse (Hippocampus).There are numerous species of copepods some are pelagic (drifting) in the water columns and some are benthic (bottom-dwellers). Rotifers are another category of zooplankton and they consume phytoplankton and microalgae and are consumed by many fish varieties, shellfish, corals, and other organisms. Baby fish often consume rotifers as they are the smallest of the zooplankton (50-1000 µm) . Some species are freshwater, some brackish, and many live in the marine environments. Whatever the species, it is always important to make sure the rotifers are enriched with algae before using to feed baby fish. If the rotifers have empty stomachs the baby fish will not get enough nutrition from digesting them. In aquaculture the use of live and freeze dried algae cells is very common. Even brine shrimp should be enriched. Be careful when feeding baby fish as they are very sensitive to ammonia poisoning from overfeeding which is easily done. We recommend always using a good quality free ammonia (NH3) monitor like a seneye. The biomass of phytoplankton contains more carbon than that of zooplankton, therefore phytoplankton tend to be a more important food resource to faster growing soft corals. So much so the phytoplankton consumers on coral reefs can decrease phytoplankton levels 15-65% below other open ocean waters (Yahel et al 1998). Hard corals on the other hand prefer zooplankton but again these really need to be healthy and enriched on alage. Easy reef’s Easy Booster product contains a good blend of algae cells; Isochrysis T-ISO (33%) / Nannochloropsis (31%) / Tetraselmis (18%) / Phaeodactylum (18%). All of these microalgaes in this formula provide an optimum nutritional profile for aquarium animals. Yahel, G, Post AF, Fabricius K, Marie D, Vaulot D, Genin A. 1998. Phytoplankton distribution and grazing near coral reefs. Limnol Oceanogr 43(4): 551-563. Click on the image below for more information!